Thursday September 11th 1924 I was at home all AM. I walked out to Mollie Folsoms and then over to Hedges. Tishie and I went to the Cemetery together. I rode home in The Bus and got here before Ott & Fannie. She had been to a Red Luncheon. I had a fine letter from Warner McCall. There was a storm early in the evening with frightful lightning. Friday September 12th 1924 Fannie & I went up to Hatties for the day. Mrs Swisher was there. I had a letter from Lizzie Lindley telling of the death of her sister Fannie Graham in Los Angeles the 6th of this month. I wrote Lizzie in the evening. 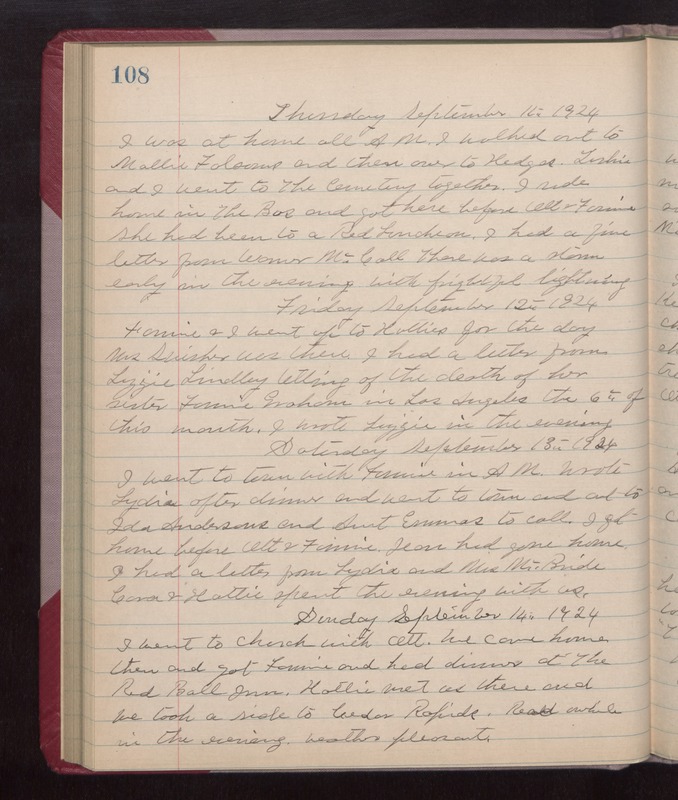 Saturday September 13th 1924 I went to town with Fannie in AM. Wrote Lydia after dinner and went to town and out to Ida Anderson and Aunt Emmas to call. I got home before Ott & Fannie. Jean had gone home. I had a letter from Lydia and Mrs McBride. Cora & Hattie spent the evening with us. Sunday September 14th 1924 I went to church with Ott. We came home then and got Fannie and had dinner at The Red Ball Inn. Hattie met us there and we took a rode to Cedar Rapids. Read awhile in the evening. weather pleasant.